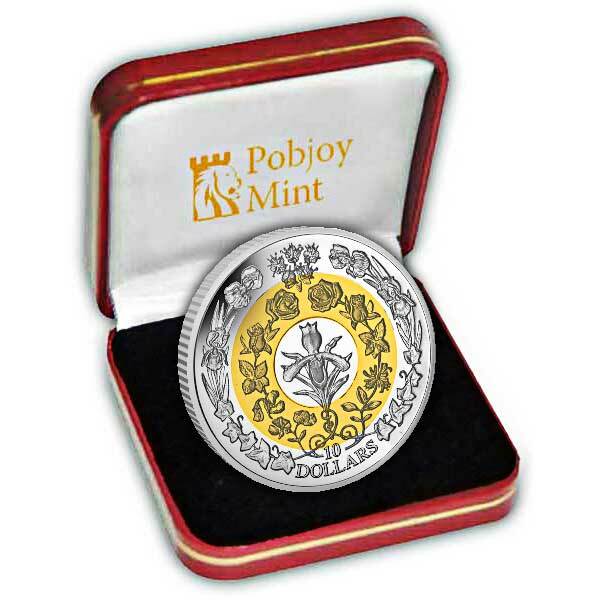 The Pobjoy Mint are extremely happy with this tri-colour coin and have spent a lot of time making every flower associate with HM Queen Elizabeth II and HRH Prince Philip's wedding anniversaries together. The 3 circles of the coin are consisted of Silver Platinum Plated, Silver Gold Plated and Proof Fine Silver. Queen Elizabeth II and HRH Prince Philip have had an impressive life together and have devoted their lives to the duty of monarchy. The couple met each other at the Royal Naval College in Dartmouth in 1939 when the Queen was just 13- years-old, and started exchanging letters prior to eventually becoming engaged in 1947, following the Queen's 21st birthday. The external circle represents the 25th Silver anniversary and reveals Irises to represent wisdom, promise and faith. Ivy, representing wedded love, love and fidelity is also portrayed along with Myrtle, a Hebrew symbol of marital relationship. The Myrtle present in Her Majesty's wedding arrangement was in fact grown from the Myrtle in Queen Victoria's! The centre circle represents the 50th Golden Anniversary and shows Roses to represent inner joy, happiness and true love. Sweet Pea and Honeysuckle are also present as they are the flowers that represent the birth months of The Queen and the Duke of Edinburgh respectively. The inner circle represents the 70th Platinum Wedding Anniversary and shows an Orchid representing love and long life. The obverse includes a dual effigy of HM Queen Elizabeth II alongside her hubby HRH Prince Philip in the main ring which is developed by and special to Pobjoy Mint. Sweet Pea and Honey Suckle are also repeated on the centre ring. 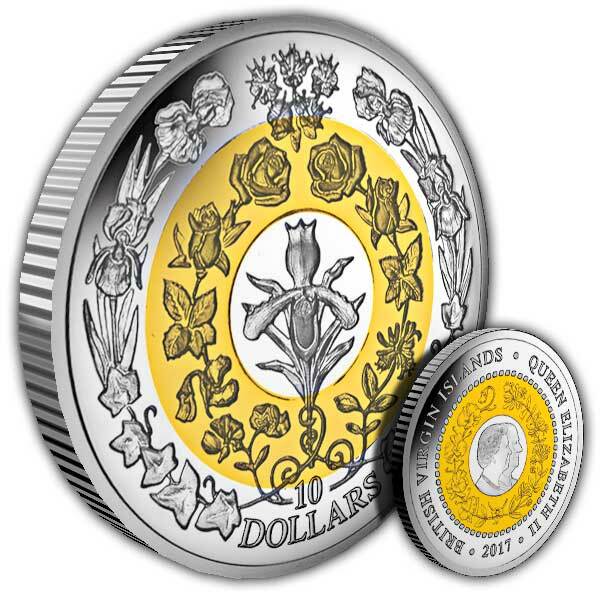 The issue limitation of this coin is set at 1,947 (to mark the year of their marital relationship) and has a $10 worth on the reverse.